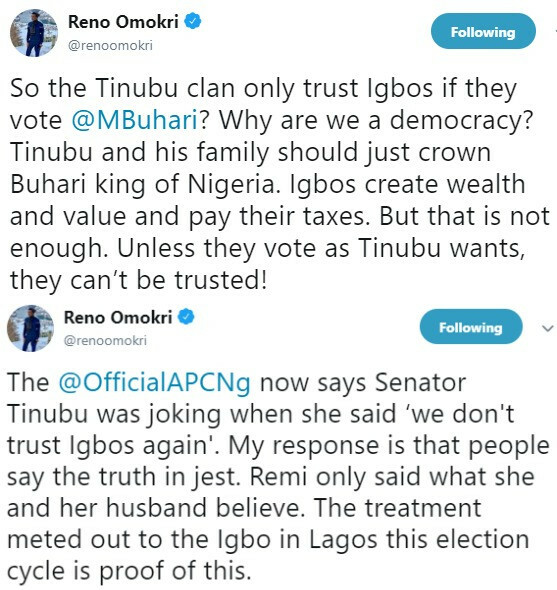 Yesterday, a video showing the wife of APC National leader, Remi Tinubu, jokingly telling an Igbo voter that the party in Lagos state doesn't trust the Igbos surfaced online. Nigerians took to social media to react to her comment, many of them condemning her. Taking to his twitter handle to react, Reno Omokri rejected the claim that she was only joking. According to him, Mrs Tinubu only spoke the mind of her husband.